Designed exclusively and stylishly furnished to sleep six with en-suite and four poster bed to the master bedroom and family bathroom, this holiday barn conversion is set amongst beautiful countryside. Neighbouring Frogs Hall, set within the owner’s twenty acres of grounds comprising small, private livery yard, grazing paddocks with horses, large lawned garden, free use of fishing lake, private pool, hot-tub and lounging area set inside a large covered enclosure (open daily 9am to 6.30pm Easter or 1st Apr - end Oct). 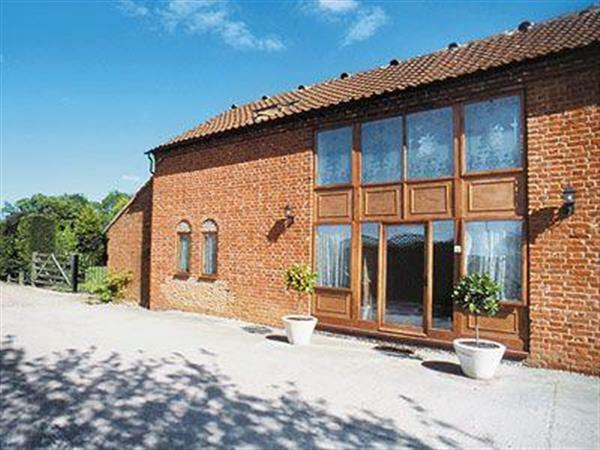 Swanton Morley with its country pubs offers an excellent touring base to explore Norfolk, a nature lovers paradise. With its market towns, historic homes, parks, golf courses, leisure facilities, outstanding coast, Royal Sandringham, wildlife parks, Dinosaur Adventure Park and the Norfolk Broads all within easy reach. Close by is the beautiful city of Norwich. Shop, pub and restaurant 1.5 miles. Ground floor: 3 bedrooms: 2 double, one (four poster) with en-suite shower room with toilet, 1 twin. Bathroom with bath, shower cubicle and toilet. First floor: Living/dining room/kitchen with beams. Underfloor heating, electric, bed linen and towels included. Travel cot. High-chair. Video. DVD and small library. Stereo/CD. Electric cooker. Microwave. Washer/dryer. Dish washer. Lawned garden. Ample parking. Private swimming pool, open 9am-6.30pm, Easter/1st Apr-Oct. Hot tub. No smoking please. Natural water supply from borehole. NB: Unfenced, ornamental pond in the garden. Holidays at Pheasant Roost run from Friday to Friday. For a better idea of where Pheasant Roost is, you can see Pheasant Roost on the map below. Pheasant Roost is in Norfolk; should you be on the lookout for a special offer, you can find all the special offers in Norfolk. It's always worth checking to see what is on offer at the moment. Do you want to holiday near Pheasant Roost (W40012), you can see other cottages within 25 miles of Pheasant Roost; have a look to find your perfect holiday location.